The latest Hyundai i20 1.2-litre is a supermini that will be beloved by people who want something simple and easy and also by those who really know their small cars. It's smarter and better equipped than before and is backed up one of the industry's best new car warranties. Let's say you want to buy a car. You might not be particularly interested in cars but you need one. Where do you even start? If you're not an automotive enthusiast, there are just stacks of brands and an even greater proliferation of models. The jargon is completely impenetrable and all you want is something cost-effective that won't let you down. Thankfully, Hyundai has something for exactly this sort of customer. It's called the i20 and is a supermini with a big array of talents. It first appeared in 2008 and nobody paid much notice. Since then it has just got better and better, particularly since the launch of this second generation version in 2016, recently facelifted to create the car we're going to look at here in base 1.2-litre petrol form. If you're looking for a small supermini that you can buy without regrets or too much in the way of homework, it's as good as any we can think of. The i20 1.2-litre comes with two different power outputs; 75PS for the very cheapest cars and 84PS for the better-equipped trims. The difference in performance isn't all that great, with one getting to 62mph in 13.6 seconds and the other taking 13.1 seconds. Around town you're unlikely to notice too much in the way of difference, both getting the same five-speed manual gearboxes. Designed by Europeans, in Europe for European conditions, the i20 copes well with the sort of roads we get here in the UK. The ride remains quite supple unless the car is loaded to the gunwales and the electrically-assisted steering system takes the hassle out of tight manoeuvres in town. Visibility all-round is excellent and there's a clever hill-start assist system available to prevent you rolling back when you're starting the car on an uphill incline. 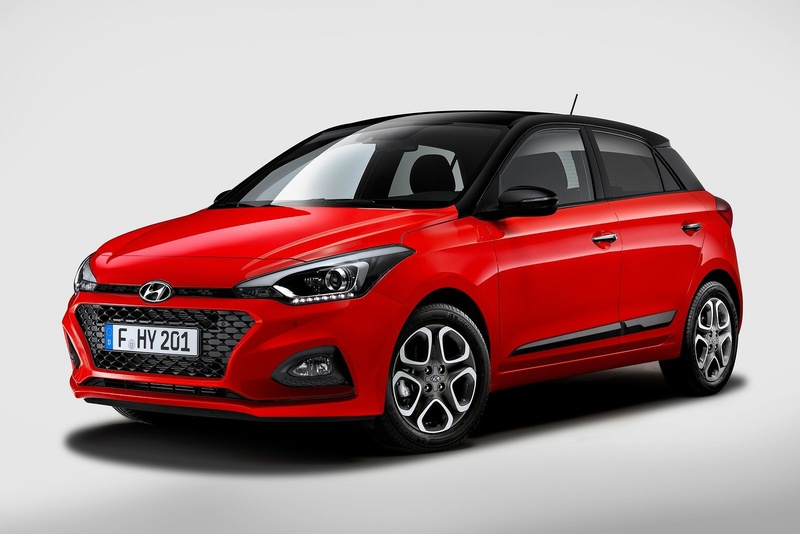 Of all the cars in its line-up, the i20 has traditionally been Hyundai's most conservatively-styled thing, but the looks of this improved MK2 model are slightly more eye-catching. The front of the five-door variant now features redesigned front bumpers including the 'Cascading Grille' recently seen on the brand's other cars. The rear of the i20 five-door also has updated bumpers and rear combination lamps and the tailgate has been reworked to integrate the license plate. There are smarter 15-inch and 16-inch alloy wheel designs too. And there's the option of a 3-door bodystyle if you want it. The interior remains quite smart, with the design maturity of a much bigger car. Previously, a major omission on lower-order variants was the kind of centre-dash infotainment screen that buyers expect from virtually every modern car these days. To put that right, the 7-inch monitor that was previously limited to the priciest derivatives is now fitted across the range and features 'Apple CarPlay' / 'Android Auto' smart-phone mirroring. At the top of the range, this monitor supports a built-in navigation system. As for practicality, well the back seat remains quite spacious by supermini standards and there's a decently sized 326-litre boot in the five-door variant. The rear bench folds flat in this version, meaning capacity is boosted to 1042-litres with the rear seats folded. The entry level 1.2 75 S five-door variant starts at around £12,000, with the S Air version of that car (with manual air con) weighing in at just over £12,500. Above that in the range, you get a choice of three or five-door body styles (prices either way are similar) with variants based around the perkier 84PS engine. For SE trim, you're looking at just over £14,000, for Premium Nav trim around £15,500 and for range-topping Premium SE Nav soec, you'll be paying around £16,500. Even the entry-level S gets electric front windows, remote central locking, tinted windows and RDS radio with USB. Spec changes with this revised model include the addition of a centre-dash 7-inch infotainment screen on lower-order models. As before, the infotainment system has USB and auxiliary connectivity fitted as standard and can be specified with an integrated My Music function, along with Bluetooth hands free, where up to 1GB of music can be stored and played. Plus you can specify 'big car' features like a panoramic sunroof, automatic folding door mirrors, a heated steering wheel and a special automatic windscreen defog system. A key new option available across the range is a Phantom Black two-tone roof. There's also now a lot more camera-driven safety kit on offer, including the latest Hyundai SmartSense active safety and drivers assistance systems. These include Lane Departure Warning System (LDWS), Lane Keeping Assist System (LKAS), Autonomous Emergency Braking (AEB) city and interurban, Driver Attention Alert (DAA) and High Beam Assist (HBA). Fuel economy looks reasonable, the 1.2-litre cars with 75PS engines returning a combined consumption figure of 55.4mpg with emissions of 119g/km. Step up to the 84PS engine and you actually do a little better - 58.9mpg and carbon dioxide emissions of 112g/km, so it remains in the same taxation band. Residual values look strong, bolstered by Hyundai's excellent five year unlimited mileage warranty. Buy one of the S trim 1.2-litre cars and predicted residual values stand at 46% of cost new after 36 months/30,000 miles. This drives down contract hire rates for business customers. If you�re looking for a new Hyundai i20 1.2 MPi Play 5dr Petrol Hatchback for sale, you�ve come to the right place. At Bristol Street Motors we don�t just have the best Hyundai i20 1.2 MPi Play 5dr Petrol Hatchback deals, we also offer friendly advice and help with all your enquiries to ensure your buying experience is a happy experience.